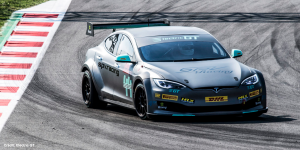 The series required special approval by FIA over safety concerns but is to go ahead with racing Teslas (we reported). The new roadmap is the latest signal that they also intend to stay. Promoter Electric GT Holdings issued their strategy emphasising their intention to open the race for other manufacturers as well. In its fourth year, the series will become an open-platform series, following GT/LMP closed-wheel style body specifications. All vehicles will share the same base (including chassis, cockpit, suspension, brakes, safety equipment, battery and BMS), but featuring OEM specific bodywork, and with transmission, motor and powertrain open to be developed by each manufacturer. The promoters say a “number of global manufacturers, including a growing number of Asian constructors, have shown great interest in joining the championship,” and have reached out to GT Holdings. Common regulations are currently being drawn up that meet the interests of all electric car manufacturers. Renault to debut new Zoe this year in Paris?